Innovative Natural Medicine Institution - ARTE AMAZONIA provides a global voice through art for the indigenous cultures of the Amazon. Medicinal herbs, specialty oils and musical instruments are part of traditional rituals that shamans used as part of their healing to believers and patients who rely on traditional medicine to deal with physical and emotional ills. Hand in hand with a projection of support for culture and indigenous development, Venezuelan authorities inaugurated in the eastern state of Delta Amacuro a training center and shamanic healing. 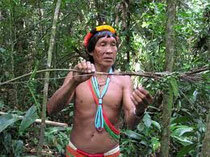 The institution is based on knowledge of the Warao people, one of the 40 ethnic groups living in the South American country, and is the first of six projected shamanic healing centers to rescue ancestral values ​​and culture. A note from the Ministry of Indigenous Peoples, created during the government of President Hugo Chavez indicated that this initiative is to preserve and expand a traditional culture formed by the practice of rituals and experiences of millions of years. The center located in the El Moriche benefit more than 20 indigenous communities, with 600 families who were hitherto seen at the houses of his shaman (indigenous doctor). The Minister of Indigenous Peoples, Nicia Maldonado said in the inauguration that the work represents a dream for indigenous communities because it strengthens their culture and communities to practice incorporates ancient rituals. The center has a living room and home of shamans, specialists in different branches of traditional medicine as well as areas for cultivation of medicinal plants and dining room for patients.